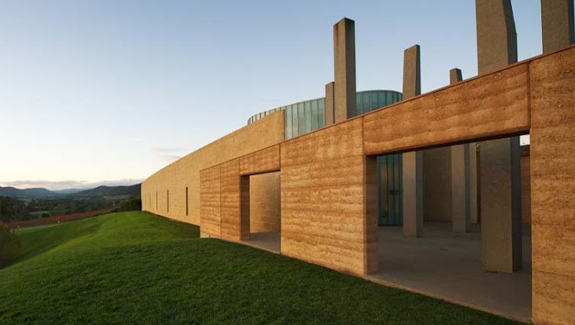 Tarrawarra Art Museum was constructed in the Yarra Valley as a showpiece for the Besen family art collection and to exhibit single artist retrospectives and other shows. The architect Alan Powell wanted to build a natural earth wall construction which blended with the environment and stood out at as an exceptional structure. Rammed earth was chosen as the material for the walls. However, one of the issues with rammed earth is the capacity of the wall to absorb water and deteriorate over time. The Tech-Dry admixture Plasticure was chosen to produce a water repellent inside and outside surface and wall with no loss of the charm of natural earth. Earth Structures carried out the wall construction using rammed earth with Tech-Dry Plasticure integrally mixed with the earth. There were no fumes or solvent to escape during construction so this was an environmentally friendly operation. The resultant wall does not absorb significant water so energy is not wasted heating the walls to remove water. This results in a more energy efficient building. As a privately funded, public art museum, high numbers of visitors already came through since it’s opening on 18th December 2003. To minimise abrasion of the walls by the visitors passing by, Tech-Dry’s dust binder, Earth Binder, was applied to the finished walls.